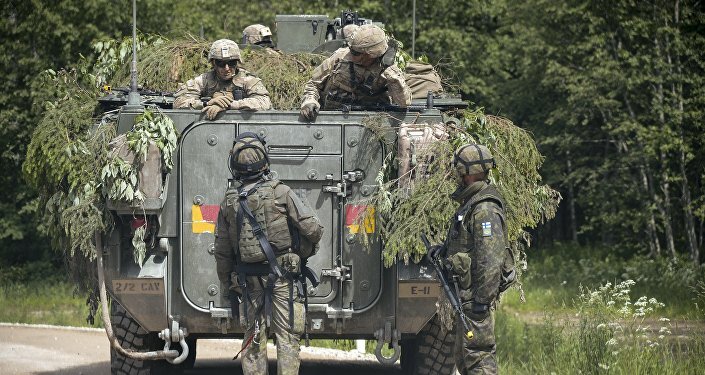 A North Atlantic Treaty Organization (NATO) contingent consisting of 130 British servicemen will arrive in Estonia on Friday, the Estonian Defence Forces inform. TALLINN (Sputnik) – NATO’s decision to deploy four multinational battalions to Estonia, Latvia, Lithuania and Poland was announced by NATO Secretary General Jens Stoltenberg after the July 2016 summit in Warsaw. There are already over 80 British servicemen in Estonia. On Friday evening, 130 UK soldiers are set to land at the Amari Air Base southwest of Tallinn, the main headquarters of the Estonian Defence Forces said in a statement. More British troops, as well as servicemen from France and Denmark, will arrive in Estonia in the coming weeks, with the last troops of the NATO battalion to be stationed in Estonia set to arrive in the country in the first half of April. NATO has been boosting its military presence in Europe, particularly in Eastern European states, since the outbreak of the Ukrainian crisis, citing Russia's alleged interference in the internal conflict as justification for the move. Moscow has repeatedly denied the allegations that have not been supported by factual evidence, also warning that amassing troops and military equipment on its borders is provocative, violates past NATO pledges, and can lead to regional and global destabilization.